Place baguette rounds on baking sheet. Brush with olive oil and sprinkle with Parmesan. Place under broiler under edges begin to brown; remove from oven. Mix goat (feta) cheese and cream cheese; spread on baguette slices. 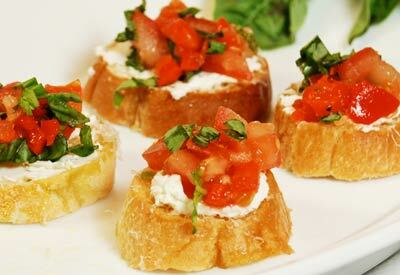 Mix tomato and basil and place a Tablespoon on each baguette. Serve.